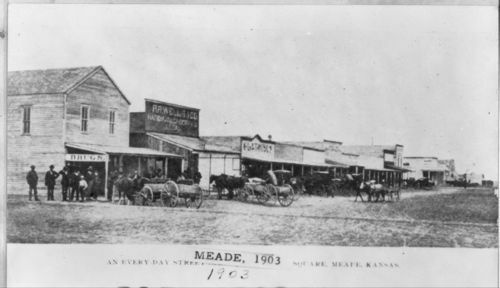 These photographs show views of drug stores and businesses on Main Street in Meade, Kansas. The first photograph shows a building with a sign reading, "Drugs" at the left end of a row of businesses. Several people are visible standing in front of the buildings, and several horse-drawn wagons are visible in the street. The second photograph shows businesses on Main Street in the 1950s. A sign for a drug store is partially visible near the middle of the buildings on the left side of the street. Another sign for Rexall Drugs is partially visible far in the background on the right side of the street, just before the trees begin on the right. Several other business buildings are visible along the street, and several automobiles are visible. Holding Institution: Meade County Historical Society, 1973.